Skin lesions are very common. Virtually every one of us will have had or will develop at least one skin lesion during the course of our lives and most of us will develop more than one. Fortunately the vast majority are and will remain entirely benign. Our skin is subjected to considerable wear and tear from an early age. Sun exposure is a major skin irritant. However it takes years for such irritants to manifest in the form of a skin lesion. Therefore the resulting skin lesions tend to occur in adults and in middle age / elderly. The cause of skin lesions, particularly moles, in children and young adults is not clear. Longstanding sun exposure is probably not a factor in this age group. A mole which was once flat becoming raised. Cancerous growths on the skin are common. Fortunately the majority are slow-growing and they do not spread. Furthermore being on the skin surface they are usually diagnosed at an early stage. Sun exposure over the years plays a significant role in the growth of skin cancers. The role of sun exposure also explains why the majority occur on the exposed skin – the face / neck, the upper chest and on the back of the hand. The majority of solar related skin lesions occur in middle age and in the elderly. However it takes many years for the effects of the ultraviolet light of the sun to manifest on the skin for this reason. Malignant melanoma is the exception – it is a potentially very malignant tumour with a tendency to spread. Most melanomas arise in a pre-existing pigmented mole. Therefore any mole which changes or displays suspicious features should be assessed by your Doctor and removed. The majority of skin lesions can be treated in a relatively simple manner. This entails an initial consultation where the lesion will be examined and assessed. If the lesion requires excision an appointment will be given for a future date. Generally a lesion will require surgical excision under local anaesthesia. If a skin cancer is suspected a diagnostic biopsy may have to performed. In this case, treatment is completed as soon as the histology report is available. Some simple skin excisions do not require sutures. In other cases sutures may be used. 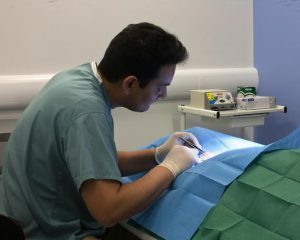 If sutures are used a follow up appointment will be made and sutures removed. There is no fee for suture removal/review. Post-operative pain and discomfort is usually mild and simple over the counter pain relief medication will suffice. If you are concerned about a skin lesion or any other changes please consult with your Doctor.